Got your own bespoke garage door design? 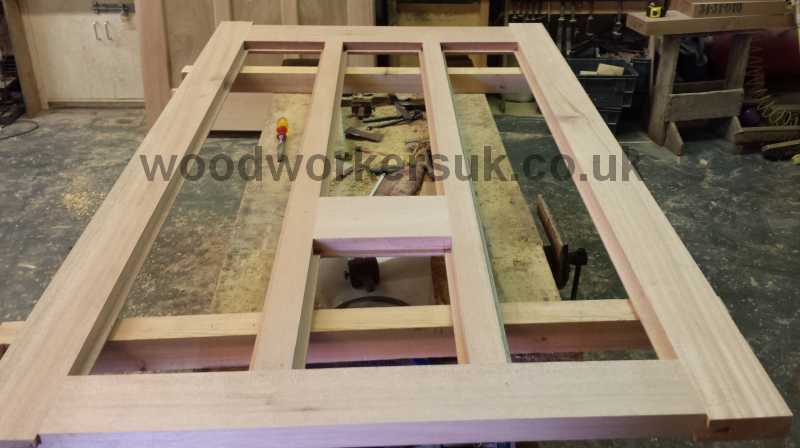 As well as our standard range of timber garage doors which are available made to measure, we are also able to offer a complete bespoke manufacturing service for you own designs of garage doors. If you can provide us with a drawing, sketch or picture of the design you require along with relevant dimensions then we will take a look at it and provide you with a personalised costing as well as any feedback about the door – in some cases we may recommend altering certain aspects of the design for strength etc. 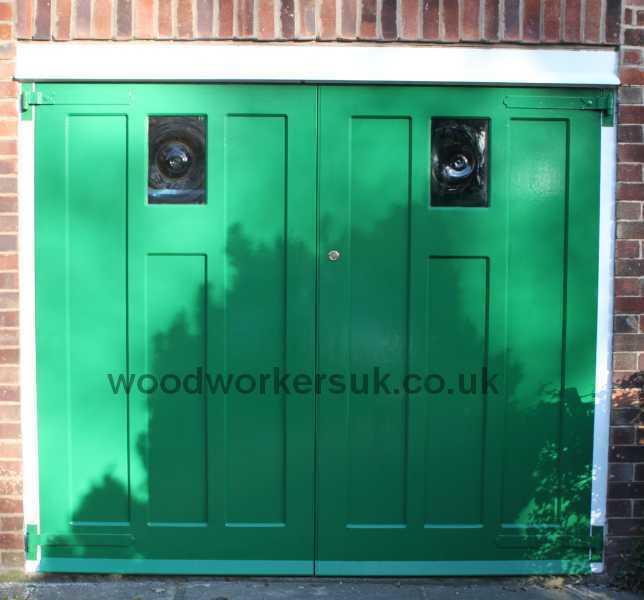 Please note however that all of our timber garage doors are based on a minimum of an EX 4″ x 2″ (EX 100mmx 50mm) thick wedged mortised and tenon jointed frame for strength and rigidity and we would incorporate at least a framework of these dimension into your doors. Any size, shape or design of doors made? No, we’ll have a look at your picture of sketch for you. If we feel a particular aspect of the design is weak then we will not make it for you – instead we will work with you to improve the design. So you don’t make any design of garage doors? No, not if it means they are a weak design and will not last. 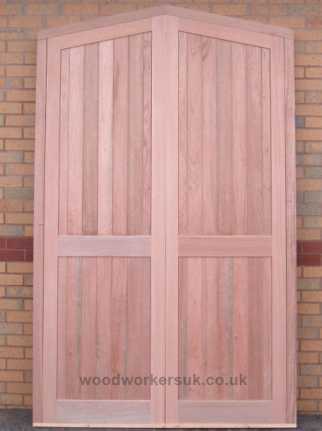 A pair of bespoke garage doors (with frame) featuring an angled head. Pictured in Meranti. These were for quite a narrow garage. Trying to match an existing garage door design? If your current garage doors have seen better days and you’d like to replace them with something as close as possible then we can help! 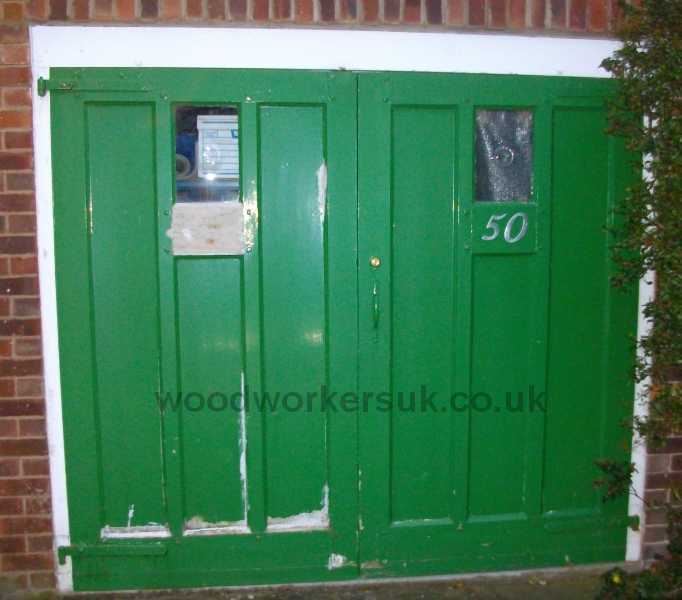 These bespoke panelled garage doors were a set of 1950’s garage doors that were original to the house. Our customer wanted something as similar as possible in timber to suit their home and after finding nothing available anywhere that was remotely near enough asked us to manufacture – the replacement bespoke garage doors are pictured on the right. 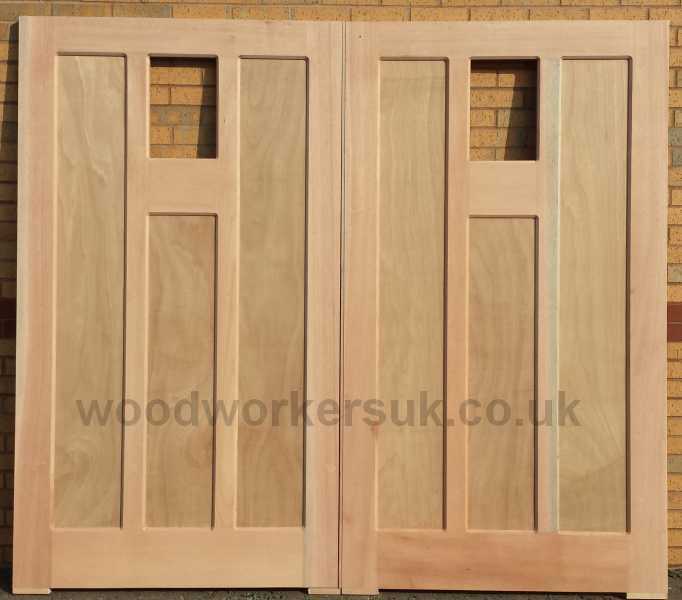 Below the doors that were made as replacements can be seen without the panels during construction (below left) and completed awaiting despatch (below right). The doors themselves are made in Meranti as they were to be painted, panels are Marine Grade Plywood for extra weather resistance! Bespoke garage doors – If you can sketch it, we can make it! To get a price on your own garage door design we need an idea of what you want. Please either email your sketch or picture to us at [email protected], send it through as a fax to 01745 531001 or pop into our workshops and we can then take a look at it for you.. Please note: In almost all cases we are unable to provide costings for bespoke garage door designs over the telephone without first having received a picture or sketch of your design.